Scenario, is the new software package that manges power quality and performs predictive maintenance. When used in conjunction with the Power Recorder, Scenario identifies deterioration in various elecrtical distribution systems by alanlyzing virtually all electrical parameters of the network. There's been a massive increase in electronically controlled devices in businesses which are vital to our modern economy. This sensitive equipment requires reliable and stable power sources. The new Scenario software can ensure power is supplied with a high level of integrity and reliablity. The economic benefits of the Predictive Maintenance systems in Scenario are very attractive to customers who are vulnerable to power problems. Numerous operations lose hundreds of thousands and in some cases millions of dollars when their electrical systems fail. 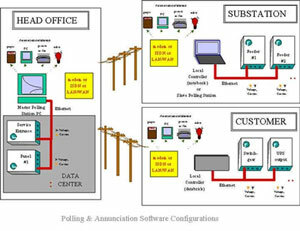 Scenario is a suite of powerful, easy to use tools that employs trending database techniques to sort the data from one or more monitors to determine if the power system is deteriorating. Without this tool, it is impossible to analyze large volumns of data, reduce it to meaningful information and devise an intelligent course of action. Reliable Power Meters has developed algorithms which "drill down" and examine the data from a variety of aspects. This process highlights elements within the distribution systems that are failing. It makes much more sense to try and ward off disaster -- because damage, failures, and shutdowns are very costly for customers such as data centers, high tech manufacturing, and utility companies. Advance warning of impending problems provide industrial, commercial, and utility companies time to make repairs and avoid significant economical losses. The information provided by Scenario directs owners and operators of electrical systems to idenify failing elements and be proactive in their maintenance and repair. What do you need to use Scenario? Reliable Power Meters, 400 Blossom Hill Road, Los Gatos, CA 95032-6117. Tel: 408-358-5100; Fax: 408-358-4420.